Next stop, BFF and I drove down the road to Desert Rose winery. 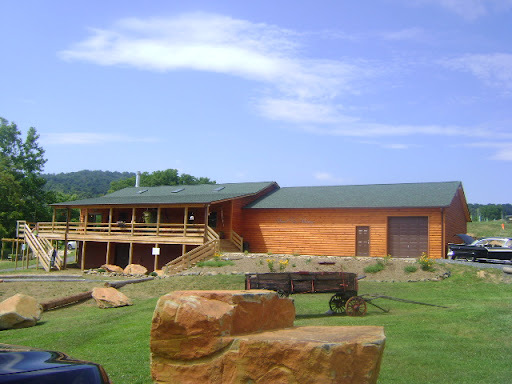 We pulled up to a ranch style building with lots of land and a small pond on site. Upon walking up the steps, we were greeted by a nice gentleman in a cowboy hat who introduced us to his porch dog and led us into the winery. Once we got in, the place was bustling with folks getting their sample on. There is even a kiddie corner. (Yes, I side eye anybody who bring their kids to wineries. This is grown folk bidness!) Once we found a spot at the bar, we were warmly greeted by one of the attendants who gave us the wine menu. (Which I have since misplaced! *cries in my wine*) We had the opportunity to enjoy about six different wines, including one premium wine they served with a small chocolate square instead of a cheese place. No free wine glasses from this spot. The owners, a husband/wife team, are so nice and engaging. They are from Seattle, my BFF's former home state so she enjoyed chatting it up with them. Desert Rose is still fairly new and it has that new building smell. If that makes sense. 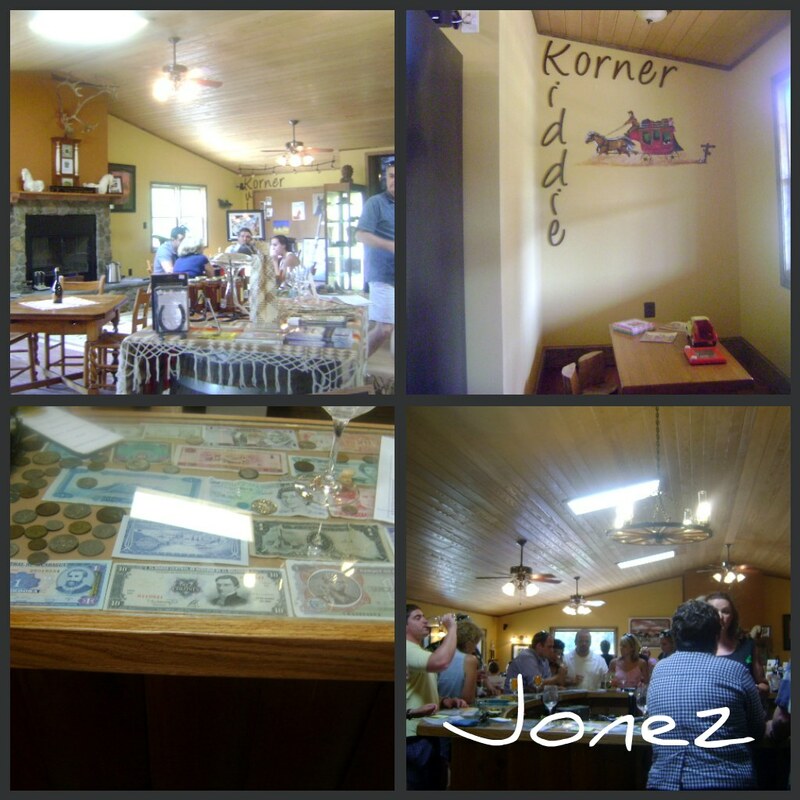 I absolutely loved their counter tops, which is filled with currency from different countries. The husband used to work for the C.I.A. 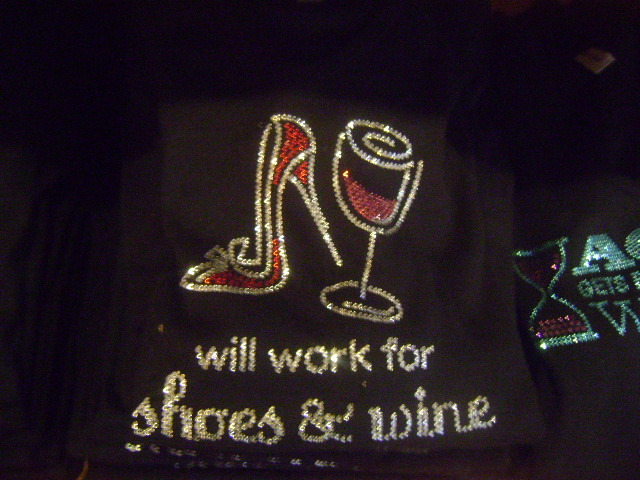 (I think) and has traveled all over the world before retiring into the world of wine. Bada$$! I absolutely adored their bathroom! 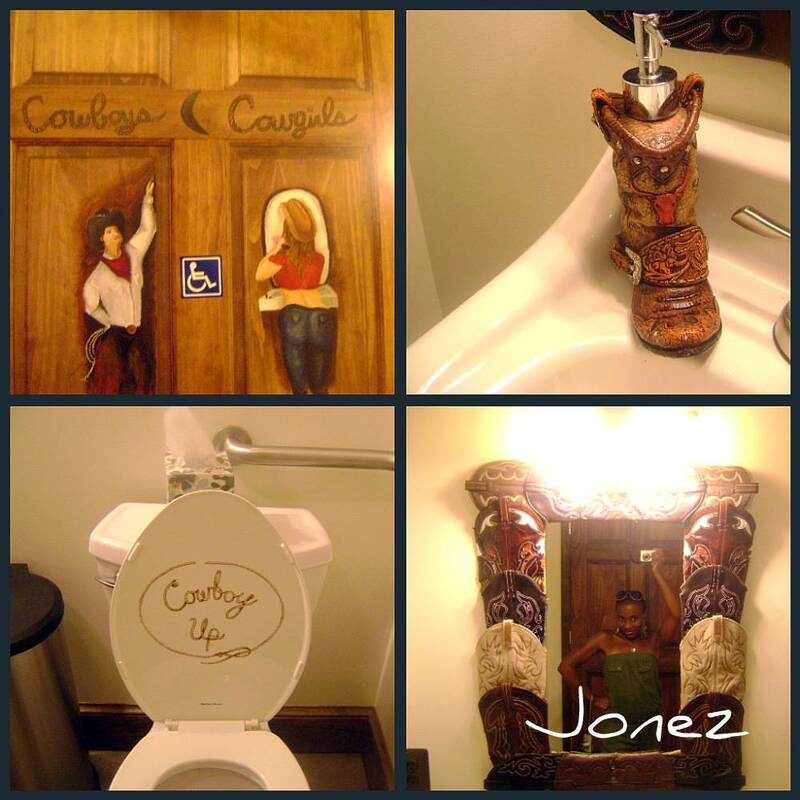 It continues the whole cowboy theme and just flows. We only stayed here for an hour as we were anxious to head out to the next winery, Hume winery. Which was less than five minutes away. 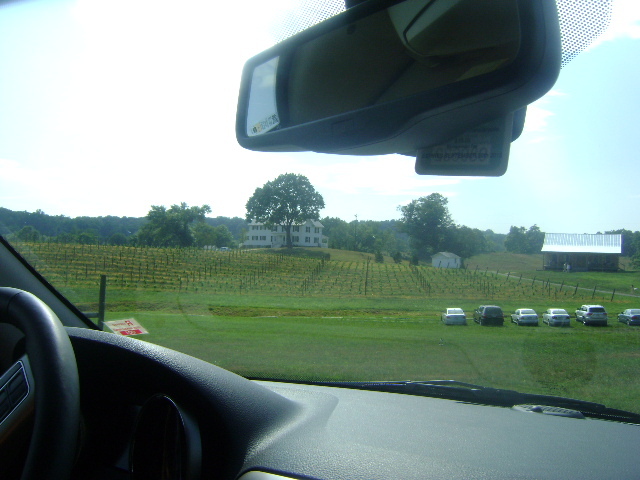 Upon arriving on the grounds, it looks like I'm entering a big plantation field with it's neatly lined vineyards and big white house on the top of the hill. Again I didn't take a lot of pictures here and misplaced my notes. I remember we lingered at this venue since it was pretty deserted. One of the guys working the counter was deaf/hard of hearing just like us so we enjoyed chatting it up with him. Hume had like 5 or 6 different wines on their menu, in addition to their cheese plate. I remember the cheese being really good, but not gushing over it as much as I did over the cheese at Rappahannock Cellars from the previous visit. After an hour, we were ready to hit the road to the next vineyard. Instead of consulting with my GPS, I used a a map. I cannot read a map for shyt. Make a long story short, BFF and I drove for 45 minutes in the wrong direction before we realized my error. 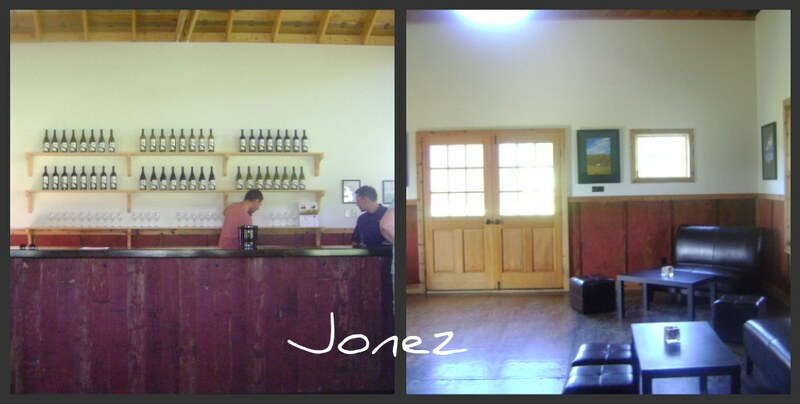 On that note, we decided to scrap the remaining two wineries and save them for another visit. Because of that error, it took close to two hours to return to DC instead of the 1.5 hour. It wasn't all that bad though. We rocked it out to old 90's jams on the iPod. Now that the fall weather is approaching and Alamo is hosting their $15 weekend car rental specials, I'm ready to plan more weekend wineries excursions. Besides for my remaining Piedmont wineries I have to visit, I also have vouchers for three other vineyards in the DC/MD area to visit before the end of the year.